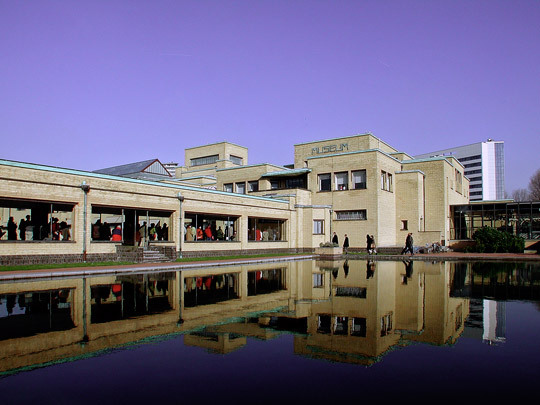 This municipal museum was the last major building Berlage was to design and was completed in 1934, a year after his death. Its entrance and lofty reception hall are reached from a roofed gallery between two reflecting pools. The museum is most famous for the magnificent play of natural light in the exhibition rooms and for the spatiality of the reception hall. Ranging galleries and rooms round a courtyard with stairs at the corners, it is generously fitted out with rooflights, heating in the walls and ceilings and humidifying units. The concrete frame is fully clad with yellow brickwork in an intricate pattern to illustrate the non-loadbearing aspect of the walls. A basic module of 1.1 x 1.1 metres stems from the size of brick used in the museum. 1996 saw work begin on a full-blown restoration in the wake of earlier extensions to the east and west sides. In 1962 Schamhart and Heijligers had added a new exhibition building in the west. Since 2002 it has housed two museums, for contemporary art and photography, after being converted by Benthem Crouwel.